When your principal refers to you as “the biggest game changer on our campus, by far,” it’s easy to see why Txe Kolstad was one of our 2014 Leaders of the Year. On the job for only one year, Kolstad took Templeton’s computer program from a basic room to one in which every student has a meaningful and purposeful experience. She knows all of her 585 preK, kindergarten, 1st-, and 2nd-grade students by name and creates a differentiated technology experience for each child that’s based on their interests, skill level, and personality. 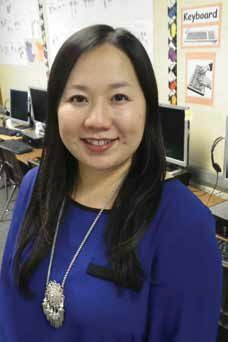 Kolstad has changed the way her fellow teachers view technology, and shifted computer skills from being a prep period for teachers to being one of the most engaging parts of the week. She’s done all of this in just two years, and one more thing: she works part time and sees each student for only 30 minutes per week. The 1st- and 2nd- grade students made PowerPoint presentations that parents viewed at Open House. They used microphones to record their voices and learned how to use flash drives. Kindergarteners use Word to create documents, and everyone is learning how to use Dropbox to name, save, and open files. One of Kolstad’s next projects is exposing her 2nd-grade classes to Google Maps. • Type to Learn Jr.